Yesterday I introduced The Accidental Feminist by telling you first what my take on feminism is. I felt like my position needed its own explanation in light of current controversy - I speak to Christian women when I say that - about what it means to be a feminist. As I mentioned yesterday, more and more I'm hearing Christian women rise up and declare themselves to be feminists and this has captured my attention and therefore demands a little bit more thought than what I've given to the position in the past. To the book, shall we?! This is the position which I also take. You might consider that this book was preaching to the choir and, in a manner of speaking, it surely was. However, the more I come up against this issue of what it means to be a woman the more I realize I need to shape my thoughts and prepare to give answers for the things I believe and, to that end, reading this book was very helpful. You may correctly assume that I agree with her message but never before have I seen it written out so succinctly and in an easy-to-comprehend manner. Reissing takes us to scripture time and time again throughout the course of this book to explain why it is she believes what she believes and to make a case for her reader to follow suit. This was precisely what she needed to do for her message to carry any weight because a person's personal opinion is not an establishment of truth. It's just an opinion. We are to define ourselves according to the Word of God and by no other source. If you are a Christian, you simply must do this. You are without excuse not to do this. Contrary to what many "modern Christian woman" would say of the arguments made in this book, Reissig is not a mealy mouthed female (she wrote a book as proof against that!) who is quiet of speech and thought and word and deed. She describes herself as rather a fiery, strong-willed female. She attended seminary (although she had no intention of pursuing a pulpit; she just has a great interest in theology) and struggled over becoming a housewife and stay-at-home mom (despite believing that was what she was called to do). She acknowledges that she is writing to herself just as much as anyone else. 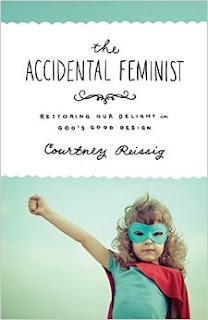 God's design for woman, argues Reissig, is that we are called to be life givers. She points back to Genesis 3:20 wherein Adam named the woman Eve, the mother of all living, a "life-giver." Eve's job as a woman (and ours) is to both be a help-meet and to nurture life. Now how this looks varies from woman to woman, a fact which Reissig is quick to acknowledge throughout the book. Her husband is a pastor and the ways in which she helps him and nurtures life in her family's home is going to look vastly different from the way I provide help to my computer engineer husband and nurture life in our home. Something I very much appreciated about this book is that in addressing our variety of life circumstances, she also encourages single women and married women without children as to how they too can fulfill their design as a life-giver and help to the Body of Christ. (And no. She is not suggesting that they submit themselves to any man for the sake of submitting to a man. A wife is to be a wife to one man and one man only. It's not a "one woman submits to every man" type of thing.) Common sense says we're not all going to be the same, act the same, or look the same. We have different circumstances, gifts and talents. Each man and woman has a different personality and what one man might need in a helper would frustrate another man. We look different in our roles, yes, but the nature of our design is the same. And this is her main point which she goes back to again and again throughout the book. "Your gender is not some arbitrary construct of your upbringing, culture, or even your own desires. It is a part of who you are. You might not be married, but you were created to be a helper and life-giver by the sheer fact that God created you as a female. Now, women today tend to hear statements like the one above and sneers begin instantly to appear on faces. Is Reissig (or am I) saying that women are less than men? No, absolutely not. (If you answered "yes" to my question then you've got some fantastic word twisting exercise going on!) Women are just as gifted and talented as men are in many ways. She didn't think she was less smart than her husband because he finished seminary and she didn't. Maybe she's more smart. A woman engineer can be smarter than a male engineer and if they both held the same job then Reissig would argue for equal pay, just as common sense would dictate. In so much as feminism has accomplished that much, no problem. But there's an attitude expressed in feminism that says, "I am not here to serve anyone" and that is an attitude which directly contradicts and does not mind the scriptures. Neither Reissig nor scriptures would argue that women must remain uneducated beings, instructed only by men and "kept down" to clean house all day. Neither Reissig nor scriptures are asking women to roll over and die as personality-less beings. But! The scriptures do call all people to die to self and serve others. Women have been uniquely called and created to nurture life and we shouldn't attempt to escape our very nature. As Reissig argues, men are created in unique ways to showcase the glory of God and women are created to showcase God's glory as well . . . but in different ways from men. Being a help-meet might very well mean working outside the home (although I would personally take issue with that if someone is just doing that because they can't stand home and I do believe Reissig would also). Being a help-meet might mean managing the finances or tending the yard or any number of culturally perceived "masculine" jobs (whatever those might be). Some men and dads are soldiers and go to war and then women are called upon to manage the home front and fulfill all sorts of roles and responsibilities. These scenarios exist, certainly, although they are not ideal. Speaking to Christians, our desire as women should be to be of help, be of service, and to nurture the life in the home. You might say that we are the heartbeat of the household. We are created and designed with this life-giving job in mind. Is it easy to be a female? (I rather suspect its no easier than to be male but for the sake of argument here, let's just say that it's not easy to be female.) It's hard to want to nurture life sometimes when the people you have been given are slowly driving you crazy. I get it. There are days when it seems far easier to trek off and do my own thing than to stay at home and raise children and make one more meal. I have opinions! I have thoughts in my head that want out! I have convictions that I share more easily than some males do! It can be tricky hard to obey the Lord sometimes and the comfort is sometimes only in the knowledge that if I "do life" His way, He will receive glory and I will receive joy. I believe that to be the truth. If you know me in real life you know that my convictions run deep. I really struggle with the notion that a great many men - even in the church - seem to lack intelligence and frequently lack backbone. (There's some uber honesty for you.) I am also a quiet introvert but there is a feisty streak in me that comes out like the blazes from time to time. My husband sometimes groans about this but he always makes sure to tell me, "I would rather know what your real, honest thoughts are than not." A man who is fulfilling his design as God intended is not afraid of women and makes no attempt to squash. Rather, he recognizes that God has given the woman as a strong and steady help-meet who is intended to bless and not curse. Women's passions and convictions do matter and have a place in the home (and the world at large). Neither I, nor Reissing, nor any complementarian would argue that women need to sit down and shut up. (Reissig would have lost the right to say so when her book was published.) Rather the idea is to remember that there is a "place" for women and a role for them to fulfill that reflects the glory of God. This role was not given to men and cannot be fulfilled by men. It is special and unique to women and this is something that we should keep in mind as we go forth to "do good works" in the name of Christ. I'm not here to put on a show as a woman, trying to prove that I am something I was not created to be. Rather, I take joy in being created female, knowing that God has a particular purpose in mind for me as a female, and that I should seek to fulfill that role gladly. Reading The Accidental Feminist was an encouragement to that end. I happily and highly recommend this read. Many thanks to Crossway Books for sending a copy of this book my direction in order to facilitate this review. I received no additional compensation and all the above opinions expressed are my own. I'm excited about this book! It sounds like a great balance to so many of the "mighty girl" arguments. A "mighty girl" in my opinion is a woman who is living her life for the LORD, even if she doesn't think she is special by being a loving wife and mother, which are two of the most difficult undertakings a woman can make a part of her life! You don't have to defy standards set up by a worldly and biased society to be a woman of might. Just be you, the best you the LORD equips you to be! I am among those who would go the other way of where the word "feminist" is headed. Like you, I do not have a positive reaction to the word "feminist" for very much the same reasons as you. And like you, I've had no need to sort out my thoughts in order to be prepared to give answers to my belief in this topic. It just wasn't necessary as many of my traits are similar to the ones you described as yourself in your part 1 post. I agree, the feminist topic is in the forefront, again. I realize that I need to have a better clarity of my thoughts in order to have the ability to intelligently give my reason to others. I thank you for your thoughts on this book. My first reaction was to not give this book a look, but then I saw you were going to read it and then checked into the book. I realized it may not be what I at first thought, simply due to the word feminist. I am glad to read that you recommend the book, and your reasons. Along with your recommendation (well thought out and written post), and the fact the author uses scripture throughout, I am hopeful that this book will be a good tool for helping me better form my thoughts on this topic in order to articulate my stand with reason. Sounds like a very beneficial book that I would agree with, and useful not just for women's roles as we usually think of them, but in getting a Biblical mindset in the transgender issue. I know one young person who calls herself "genderfluid" - she acts very feminine when she has a boyfriend, but acts gay when she doesn't. But God created us male and female, not a mix of each.